Two hostages held by Yemeni Al-Qaeda - American Luke Somers and South African Pierre Korkie - were killed by captors during a US rescue operation, it’s been officially confirmed. Korkie’s death reportedly came a day before his negotiated release. Defense Secretary Chuck Hagel, confirming the fatalities, justified the operation to free the hostages. "There were compelling reasons to believe Mr. Somers' life was in imminent danger," the Pentagon chief told journalists in Kabul. The initial report on Somers' death was broken by his sister who got informed by the FBI. "We ask that all of Luke's family members be allowed to mourn in peace," AP cited Lucy Somers as saying. A senior American official also told The New York Times that captors shot Somers while they were being attacked by US troops, according to the source. The badly wounded hostage was flown to a US naval ship in the region, where he died from his injuries. 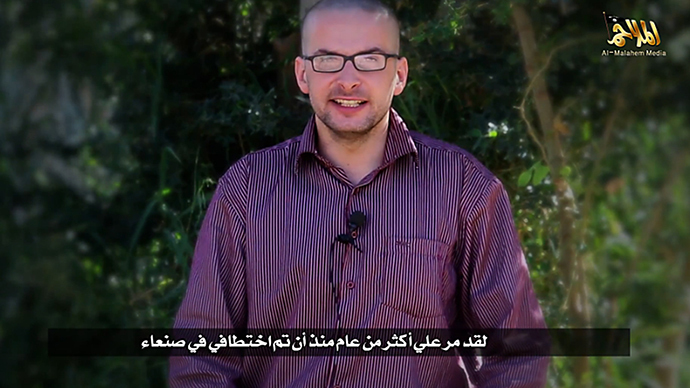 Luke Somers, a British-born American citizen, worked as a photojournalist for the Yemen Times. He was kidnapped more than a year ago in the Yemeni capital, Sanaa. Several days ago, Al-Qaeda’s Yemeni wing, Al Qaeda on the Arabic Peninsula (AQAP), released a video threatening to kill Somers if their demands were not met. Somers is believed to be one of the hostages US Special Operations commandos and Yemeni troops failed to rescue in an operation conducted a week ago. Eight hostages were then freed, but five others were moved elsewhere by the militants and remained in captivity. Expressing his condolences to Luke Somers' family, President Obama also condemned the killings and said the US would “spare no effort” in trying to bring its kidnapped citizens back home. “And terrorists who seek to harm our citizens will feel the long arm of American justice," Obama said. The death of Pierre Korkie during the rescue operation has been confirmed by the South African government. "We have been informed that the American special forces are now in possession of Mr Korkie's body,” spokesman Nelson Kgwete said on TV station ENCA, Reuters reported. “We will arrange with them and the government of Yemen to ensure that we repatriate Pierre's remains to South Africa." Pierre Korkie and his wife, Yolande, were kidnapped in the Yemeni city of Taiz in May 2013. His wife was later released and went home to South Africa. Pierre was also about to be released, according to a humanitarian organization Gift of the Givers, which negotiated with the militants. "The psychological and emotional devastation to Yolande and her family will be compounded by the knowledge that Pierre was to be released by Al-Qaeda tomorrow," the charity said. “It is even more tragic that the words we used in a conversation with Yolande at 5.59 this morning were: ‘The wait is almost over'. Three days ago we told her "Pierre will be home for Christmas". Kidnappings of foreigners have lately been on the rise in Yemen, home to Al-Qaeda’s most active branch, according to Washington. To counter AQAP, the US has been training Yemen's military on-the-ground and launching drone attacks on the militants. On Saturday morning, an anonymous Yemeni security official told AP that there was a suspected US drone attack in the south of Yemen, which killed at least 9 alleged Al-Qaeda militants.